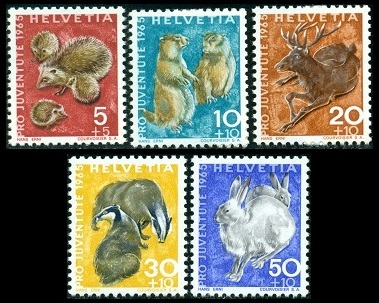 Most of the Pro Juventute Swiss stamps issued between 1965 and 1971 feature the theme of Wildlife and Birds. In a departure from previous year's issues, these sets DO NOT contain stamps honoring famous personalities. All of the Pro Juventute stamps were issued on December 1 of each year. These thematic issues are all photogravure. 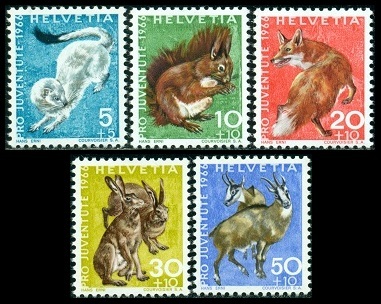 Unless stated otherwise, the surtax amounts on all these Swiss stamps benefited the Pro Juventute (For the Children) Foundation. 05 C. + 05 C. - Hedgehogs. 10 C. + 10 C. - Alpine Marmots. 20 C. + 10 C. - Red Deer. 30 C. + 10 C. - European Badgers. 50 C. + 10 C. - Hares. 05 C. + 05 C. - Ermine. 10 C. + 10 C. - Red Squirrel. 20 C. + 10 C. - Red Fox. 30 C. + 10 C. - Hares. 50 C. + 10 C. - Chamois. 10 C. + 10 C. - Roe Deer. 20 C. + 10 C. - Pine Marten. 30 C. + 10 C. - Alpine Ibex. 50 C. + 20 C. - Otter. 10 C. + 10 C. - Wood Grouse. 20 C. + 10 C. - Bullfinch. 30 C. + 10 C. - Woodchat Shrike. 50 C. + 20 C. - Firecrest. 10 C. + 10 C. - European Goldfinch. 20 C. + 10 C. - Golden Oriole. 30 C. + 10 C. - Wall Creeper. 50 C. + 20 C. - Eurasian Jay. 10 C. + 10 C. - Blue Titmice. 20 C. + 10 C. - Hoopoe. 30 C. + 10 C. - Spotted Woodpecker. 50 C. + 20 C. - Crested Grebes. 10 C. + 10 C. - European Redstarts. 20 C. + 10 C. - White Spotted Bluethroats. 30 C. + 10 C. - Peregrine Falcon. 50 C. + 20 C. - Mallards. Remember that the lots on most of the European eBay sites are priced in EUROS. The lots on the Switzerland eBay site are priced in SWISS FRANCS. The Swiss Franc is roughly equivalent to the US Dollar. Shipping charges may be more, and the lots may take longer to arrive. Also, make sure the foreign seller ships to your country, before bidding on or buying his lot.